With all apologies to Nara, nowhere in Japan can match Kyoto’s reverent connection to its history. The city served as the seat of imperial power for centuries, most gloriously during the Heian period of the 9th to 12th centuries. Walking along the city’s streets can sometimes feel like taking a trip into the past, and if that’s where you’re going, you’ll want a period-accurate map, like the interactive one developed by Kyoto’s Ritsumeikan University. Called the Heiankyo Overlay Map, the clever navigational tool (which can be found here) works with Google map’s data for the city. While New Year’s Eve is a time for parties and fireworks in many countries, in Japan, it is usually a somber time when people return to their hometowns to enjoy a few days together with their extended families – not unlike Christmas in the West. However, the lack of parties does not mean Japan is a boring place during the New Year holiday period. This time of year is rich in tradition and culture, and if you have never experienced New Year in Japan, you’re missing something. Here is a guide to some New Year traditions and what they mean. Why is New Year’s Eve called “omisoka” in Japanese? 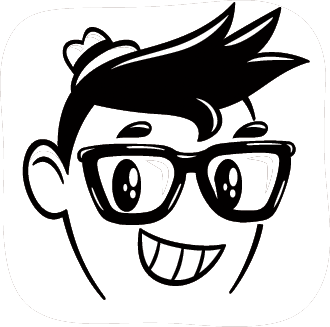 In the old calendar, the last day of each month used to be called “misoka”. “Miso” can mean 30 in Japanese, and “ka” means day. Although not every month has just 30 days, the tradition of calling the last day of the month “misoka” remained, and the last day of the year became “omisoka” (great last day of the month). After the new calendar was adopted, all the other “misokas” became less popular, but “omisoka” remained. This refers to the end-of-year cleaning which takes place in offices and homes. It is believed that by cleaning your house, you can purify your residence and welcome the “Toshigami-sama” (god of the coming New Year). As soon as Christmas Day is over, the Christmas trees and decorations come down and New Year decorations go up. “Kadomatsu” are made of three cut bamboo sticks and pine tree branches and are put up in the entrances of buildings or houses. The bamboo shoots, which represent heaven, earth and humanity, are believed to attract the gods. The gods dwell in the pine until Jan 7, after which time the decorations are taken to a shrine to be burnt, releasing the spirits back to their realm. People eat soba at around midnight to ward off evil spirits before the New Year comes. Some also wish for a long life, or long-lasting connection with families by eating soba. Rakuten research reports that 67.5% of people surveyed are planning to eat “toshikoshi soba” this year. “Joya no Kane” or purification bells are important at New Year Buddhist ceremonies in which the priest rings the bell 108 times. According to Buddhist beliefs, the number 108 corresponds to the number of evil desires that we suffer from. It is believed that by listening to or ringing the bell 108 times, you can get rid yourself of those evil desires. Many temples allow people to participate in ringing the bell. Why are there two words meaning New Year’s Day? “Gantan” generally refers to the morning or sunrise on Jan 1, while “Ganjitsu” refers to the first “day” of the New Year. On New Year’s Day, you’ll see legions of Japan Post employees whizzing along on scooters delivering New Year greeting cards. Though the custom has lost some of its popularity in recent years – young people tend to avoid sending the cards, while others design their own cards and send them by email – “nengajo” are still important for businesses and the older generation for expressing appreciation and best wishes for the New Year. “Nengajo,” many of which are hand-written, also have lottery numbers on them. The most popular activity on New Year’s Day is “hatsumode” or first visit to the shrine. The bigger shrines like Meiji in Tokyo, Kawasaki Taishi in Kawasaki and Fushimi Inari Taisha in Kyoto are packed with hundreds of thousands of people from early morning throughout New Year’s Day. Many people go to smaller shrines in their neighborhoods. If you go, you’ll see burning incense sticks. The smoke itself is called “zuko,” and shrine visitors wave it over their heads to purify spirits and their bodies for the New Year. You’ll often see people leaving shrines, holding wooden arrows. These are given to shrine visitors to put somewhere in their homes to ward off evil spirits. The point of the arrow isn’t sharp; it’s just a decoration. This refers to special New Year delicacies traditionally made before New Year’s Day, and meant to last for seven days without refrigeration. The original reason for needing it to last for seven days is because there is a seven-day period of non-cooking to appease the fire god, Kohji. He would get upset and cause a natural hazard if you made fire so early in the year. In later years, this non-cooking period has changed to give housewives a rest during the New Year holidays since they worked so hard until New Year’s Eve. The food often comes in an elaborate bento box. 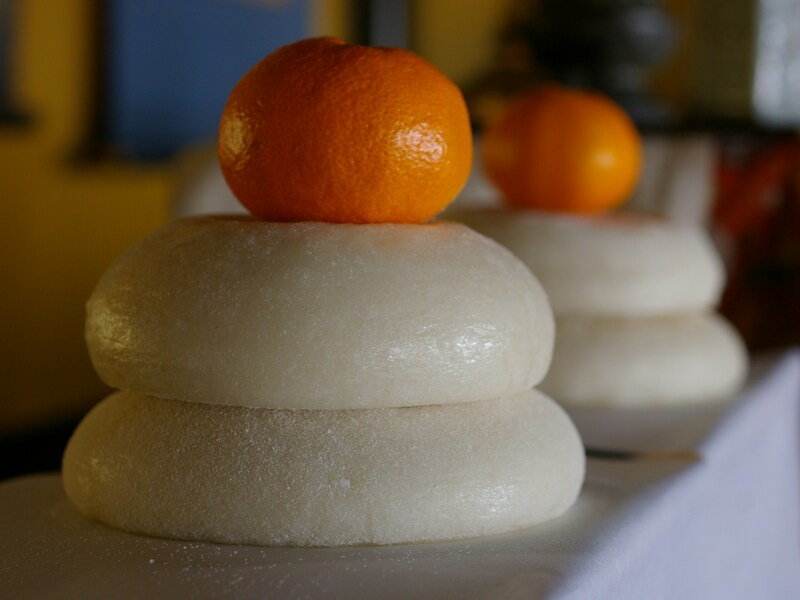 This decoration consists of two round rice cakes and a mandarin (mikan) on top. Traditionally, the cakes were adorned with a different citrus fruit known as “daidai,” which were considered auspicious as the meaning of the word can be translated to “generation after generation”, representing the family’s wish for a long and prosperous bloodline. The rice cakes are supposed to be an homage to the mirror of the sun goddess Amaterasu. With its round, mirror-like shape, “kagami-mochi” symbolizes the renewal of light and energy at the start of a new year. On New Year’s Day, children aged 22 and under receive monetary gifts from their parents and grandparents in specially decorated envelopes called “Pochi Bukuro” (Pochi bag). According to the Allabout questionnaire, the popular amounts of “otoshidama” are 1,000 yen for children younger than 6, 3,000 to 5,000 yen for children aged 6 to 17, and 10,000 yen for 18 to 20+ students. Many department stores and other retailers now open on New Year’s Day, giving children a chance to spend their “otoshidama” as well as tempting other shoppers with these lucky bags. Some people hit store after store and emerge with an armful of “fukubukuro.” The bags contain various items with a total value of twice the price of the bag. Japanese architect Tokujin Yoshioka has offered up his own reinterpretation of the classic culture of a Japanese tea ceremony with the stunning “Kou-an Glass Tea House” in Kyoto. A testament to the famous Japanese attention to detail in design and architecture, the weights and angles of the transparent glass design plays on the concept of Japanese history as well as its position in today’s society. The Kou-an allows visitors to appreciate the natural world by blending into their surroundings, while being able to view the entire Kyoto landscape from its position 220 meters above ground. While there are dozens of mochi specialty shops scattered throughout Japan, one particular shop specializing in yomogimochi (mochi mixed with mugwort, giving it a distinctive green color) in Nara Prefecture boasts much more than delicious sweets–its second claim to fame is that it employs the fastest mochitsuki champions in all of the country! The mochitsuki professionals at Nara’s Nakatanidou (中谷堂) shop make a great team. They’ve got the art of mochitsuki down to a tee, and it’s obvious that in the process they’ve also cultivated a mutual trust over the years. I mean, why else would they be so willing to stick their hands in the direct path of a mallet crashing down at full force? Miso soup is hardly ever served without its faithful rice. For centuries this edible couple has been considered the main part of a classic, healthy Japanese breakfast. “Mom’s miso soup” is, quite simply, to die for. And each Mom adds her own touch to the recipe, so the subtle flavors vary according to household. So powerful is this aromatic duo that the mere thought of smelling miso upon waking up in the morning can leave a study-abroad student salivating as he or she is transported temporarily back to the mother ship. Other than the miso base, other ingredients in the soup may include dashi broth, tofu, chopped green onion, wakame seaweed and a plethora of others. See some miso soup anime ads that bring out the true miso spirit. Try making it! Learn how to make miso soup in the Rocket Kitchen. No miso? No problem–miso can be made at home too! While women’s hands are said to be too warm to become sushi chefs, those ostensibly hot hands surely come in handy when it comes to making rice balls. This favorite snack, made from either fresh steamed rice or leftover rice from the night before, is standard fare for bento lunches and picnics. All good outdoor gatherings feature the highly portable and nutritious triangular-shaped sticky rice ball, which is geometrically formed by squeezing it just so in the palms of the hands. Each ball is filled with one of a number of ingredients from sweet salmon to sour plums, and the triangle of rice is girthed with a seaweed belt so moist, it doesn’t actually stick to your lips like the papery convenience-store kind. According to Japanese aesthetics, any food tastes better with proper scenery, so you’ll find rice balls at every “Hanami” cherry blossom party. This favorite food of foreigners is also a favorite of the Japanese (even though tempura is thought to have originally come from Portugal). Surely, worldwide, everyone loves tempura! And mama’s home made has gotta be the best. But I can’t help think that the nostalgia surrounding this food (the taste of which doesn’t vary that much from kitchen to kitchen) has to do with the method of preparation: the wife dutifully stays in the kitchen throughout the meal, only emerging occasionally when the next batch of piping hot veggies are ready to be served to her expectant family. And of course a Japanese wife is happy, perhaps even ecstatic, to do this, in order to fulfill the expectations of the perfect mother who, at least in the old days, was said to “make and serves food with all her heart” (kokorokomete ryoriotsukurimasu). Tip! Be sure to have fun with your tempura–make it colossal! A close runner up as an all-time favorite by foreigners and Japanese alike is oknomiyaki (literally “grilled as you like it”). What could be more fun than playing with your food? Mix up the cabbage with a combination of okonomiyaki flour and milk, add a raw egg, then ingredients such as mochi, cheese, fish, pork, or corn (anything really–as you like it!). Leave it on the grill to cook then top it with sweet okonomiyaki sauce! Whether Hiroshima style or Osaka style, oknonomiyaki satisfies even the most unsophisticated pallets. It’s what I serve to my parents who don’t like Japanese food (surely the only two people left in the world). This pancake-like food is certainly interactive and gets everyone communing at the table. Not only that, but such comfort foods pull at the heartstrings of boys when they become myopic, nostalgic adults missing their mommies. In Japan, the relationship between mothers and sons is supposed to be extra special (sorry girls!). Watch it! A video of one man’s gourmet food trip through Japan, including oknomiyaki. This simple dish is so fast, so simple, and so good! Just a raw egg, a little soy sauce (if you like) and some cooked white rice will give you a meal on the go. One of our RocketNews24 writers who grew up eating TKG, says it’s her go-to comfort food. Just pour the raw egg yolk over the rice and mix it together: ta-da! Isn’t that convenient?! Who said you couldn’t cook Japanese food? Nabe is one of those foods in the “cooked in large earthenware pot” family. It is stewed in a vessel that sits in the middle of the table. Meat and vegetables are added throughout the entire dinner session, with each person around the dinner table reaching into the pot with their chopsticks to pick out their own vegetables or meats (or perhaps dished out by mom) as the ingredients slowly cook. This dish is only shared with family or good friends who you’re absolutely sure don’t have any contagious diseases. The constant dipping of your chopsticks into the broth to dig out mighty morsels means that you’ll be sharing your germs. On the other hand, you can console yourself that the boiling broth may kill most of the cooties someone might unknowingly be passing on. Nabe, a winter food, is usually associated with close friends and family, the equivalent of sitting around a bonfire with a guitar and singing songs together. Being invited to a nabe party is a definitive indication you’ve been accepted into the inner circle. Try yosenabe–or “fling it all in” nabe! Make it cute! Tips on how to make your nabe look as kawaii as possible! When Japanese feel a cold coming on, they reach for okayu–a warm, easily digestible watery mush made from rice. It’s also the food of choice if you’re missing your teeth. Even Kiki, the heroine of the anime film Kiki’s Delivery Service, can be seen eating okayu in a scene when she is sick. So next time you’re feeling a bit under the weather, do what Kiki does and try some rice porridge! While both ramen and udon noodles are loved by the Japanese, I’m going to stick to Udon here because, well, it’s Japanese (whereas ramen in technically Chinese) and udon is the Wall Street Journal of noodles–it’s way more sophisticated than ramen. Ramen’s reputation is that of an easy, greasy food eaten when you’re in need of something filling and moreish but not especially good for you–often after a night out drinking. But while ramen satisfies, udon nurtures. The warmth of steam emanating from a large bowl of udon, and enveloping your face in the wintertime is enough to warm you to your toes. It’s no wonder that in Kagawa Prefecture, the udon capital of Japan, and where they are known to eat udon while in the bath, that they’re using the long unleavened egg dough to generate power. How cool is that?! Curry rice doesn’t sound like it’s Japanese, and surely its origins aren’t (Japanese curry comes from India by way of the British navy, would you believe), but the way the Japanese have modified their knock-off version is distinctly their own. It’s sweet, gooey and heaped over sticky rice! And it’s usually not spicy at all. Kids and adults alike love this cheap, easy-to-prepare food, usually made from boxed curry you buy at the store. And anything can be added to it including meat and veggies. For me, I prefer the real thing, but the fact is that Japanese kids grow up eating and loving the Japanese version. Curry rice is served in school lunches, at ski resorts, on the beach, and at restaurants everywhere. It’s ubiquitous, which means it’s a fallback food anywhere, anytime. Except abroad, where you’ll rarely, if ever, find it. We saved ochazuke for last because this dish is consumed at the very end of a meal. Ochazuke is most likely only encountered by foreigners who dine with Japanese, so may not be well-known to mere tourists. But most foreigners’ first encounter is similar: You’re at the end of a meal, feeling like a total pig because you’ve eaten so much amazing food. You’re sitting back in your chair, hands folded over the swollen stomach, thinking you couldn’t eat another bite of anything even if it were apple pie, when suddenly, someone at the table pipes up, “Let’s have ochazuke!” They tackle the waiter who dutifully takes away one thing from the table: the leftover rice. This is taken back to the kitchen, where the chef mixes it with green tea (and perhaps some other things). The rice concoction is brought back out to the table and presented as the last course, like a sort of savoury dessert. It’s warm, it’s delicious, and you somehow find a little extra room in your distended stomach for it before completely passing out. Tip! Just combine green tea and rice.